Blog Spring MVC and Spring Boot Tutorials Spring MVC: How to Declare a Bean in Spring Application? This example will show you how to declare a bean in the Spring container. Create new Dynamic Web Project CrunchifySpringMVCFramework in Eclipse. Right click on project -> Click on Configure -> Click on Convert Project to Maven Project. Open pom.xml file and add below SpringMVC 4.2.2 Maven Dependencies before <build> tag. 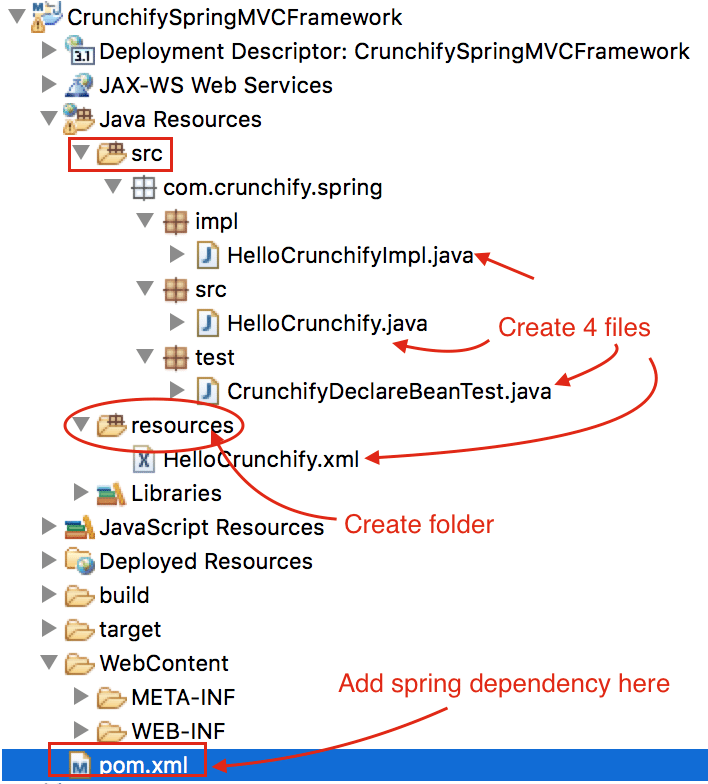 Create Spring configuration, which is a HelloCrunchify.xml file under /resources folder. The bean declared using the bean element in the configuration file. At minimum the declaration contains the bean’s id and it’s class. Create a simple bean called HelloCrunchifyImpl.java with a method called sayHelloCrunchify(). That’s all we need for our bean. Other must read: List of more than 300 Java Tutorials. Now we have the bean declared in the Spring container. The next step show you how to get the bean from the container and use it in our program. There are many ways that can be use to load the Spring container. Here we will use the ClassPathXmlApplicationContext. This CrunchifyDeclareBeanTest.java class load the configuration that found in the runtime classpath. Make sure you have similar project structure. Right click on CrunchifyDeclareBeanTest.java -> Run As -> Java Application.